Jack and Sandy Pleasant are fortunate to be stewards of 260 acres of God’s rolling hills in beautiful north central North Carolina, just 35 miles north of Durham and Chapel Hill, NC. The land now called Sunset Ridge Buffalo Farm has been in Jack’s family for 200 years. The name Sunset Ridge was chosen because of the unique feature of the property: The view of the setting sun across the rear ridge with reflections on a lake between, making for a glorious and peaceful transition from daylight to dark. In 1728 buffalo were documented to be living in the Hyco Creek bottoms. Old deeds from the late 1700’s reference ‘buffalo wallows’ as surveying landmarks, indicating that buffalo were native to the Sunset Ridge area of Person County. As a young man Jack had a vision that someday he would return to live on the family farm and make it into something unique. He first saw a herd of buffalo while on a backpacking expedition to Philmont Scout Ranch in New Mexico in 1964. 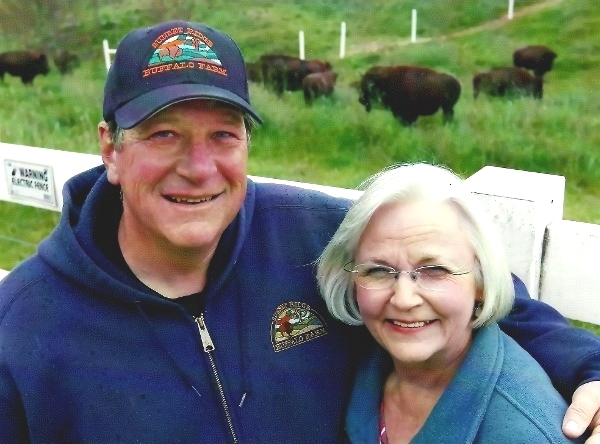 And his interest in raising buffalo began when he trekked Philmont again in 1994. After some time spent learning about bison husbandry, studying the nutrition benefits of bison, sampling various cuts of meat, and visiting a number of buffalo ranches across the country, raising buffalo seemed a natural fit for the family farm. After two years of fence and corral building, the initial herd was established with the purchase of eight calves in 2001. Currently the herd at Sunset Ridge numbers around 100. The farm is also open to visitors for guided wagon tours and is an exceptional venue for weddings and other private events.